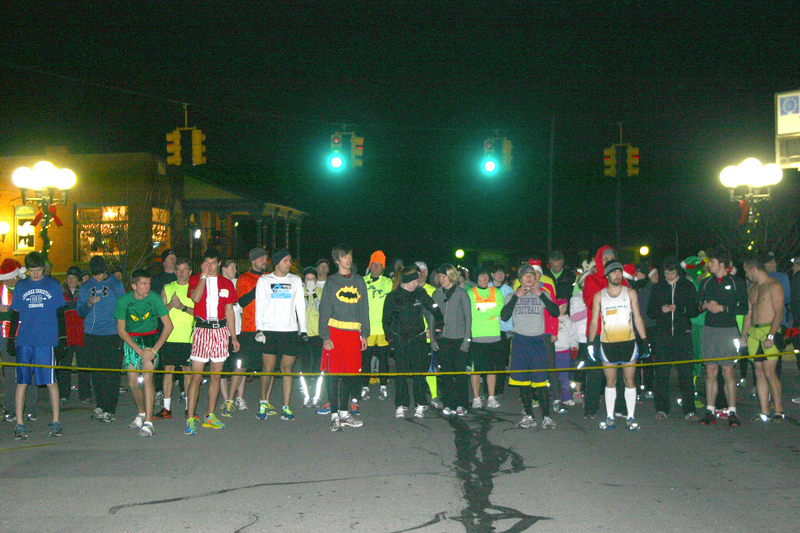 The Miss River Raisin Festival Scholarship Program hosted its first-ever night race — the Hot-Cha-Cha 5K Mug Run — on Friday in Blissfield. Despite chilly temperatures, 104 runners signed up to brave the brisk, but clear night air to compete in the five-kilometer trek. Runners from abroad and of all ages participated, from the ages of six to 80. Alex and Cassie Williams of Caro, traveled three hours and completed the run to make it their 156th race of the year. “It was a great race and you can’t beat having hot chocolate waiting for you at the finish line on a chilly night like this,” Alex said. “We had a lot of fun. The race was very well-organized and the volunteers were excellent and they were all very nice,” Cassie added. For some of the runners it was their first race, but for 80-year-old veteran racer Harrison Hensley, it was his 2,128th career race, and his 87th five-kilometer run of the year. Hensley’s friend and fellow racer Randy Fielder marked his 1,698th with the completion of the run. The overall winner in the men’s division was local runner Justin Bateson with a time of 16:07. He also was first across the finish line. The top overall runner for the women’s division was Karen Killian with a time of 19:27. In the men’s division the first- and second-place winners were: ages 6-12, Zebedee Swager finished at a time of 28:34 and Leo Swager with a time of 28:46; ages 13-15, Tommy Brandys 20:59, Jonah Schmucker 21:40; ages 16-20, Justin Bateson 16:07, Tyler Schmidt was the second runner to cross the finish line, with a time of 17:21; ages 21-35, Max Mcllroy 17:26, Aaron Al-Sorgali 18:23; ages 36-49, Mike Holik 17:47, Eric Swager 19:44; ages 50-59, Bob Bridges 19:16, Ed Carmichael 21:57; ages 60-69, David Sliwinski 25:33, Randy Fielder 27:38; age 70 and up, Harrison Hensley 39:47. In the women’s divisions, ages 6-12 Sarah Weidmayer finished with a time of 26:14, and Annabelle Smith finished at 29:22; ages 13-15, Sydney Coe 22:41, Olivia Bockey 27:35; ages 16-20, Sydne McMullen 24:57, Ashlee Lewis 27:42; ages 21-35, Karen Killian 19:27, Cassie Williams 21:41; ages 36-49, Mindy Goetz 23:37, Vicky Oliver 24:57; ages 50-59, Jane Okoroafo 24:06, Melody Carmichael 27:03; ages 60-69, Cheryll Leonard 46:14; ages 70 and up, Gretchen Warwick 35:47, Dorothy Steedle 54:01. Runners chose either to receive a Wassail mug which allowed them to sample wassail in the Blissfield Wassail Festival to a hot-chocolate mug for hot chocolate after the race. Sponsors of the event included Blissfield Coney Island, Royal Nutrition and Borchardt Brothers Market, the pageant’s general sponsor. Copyright 2012, River Raisin Publications, Inc. From the Dec. 19, 2012, edition of The Advance.